Troy Alpha ear cleaner is an antiseptic and cleansing formula for treating ear problems in dogs. It aids in prevention and treatment of ear infections, odour control and wax breakdown. Alpha ear cleaner works on Otitis externa in dogs and cools their inflamed ears. Gentle on ears, it is safe to use along with other topical treatments. 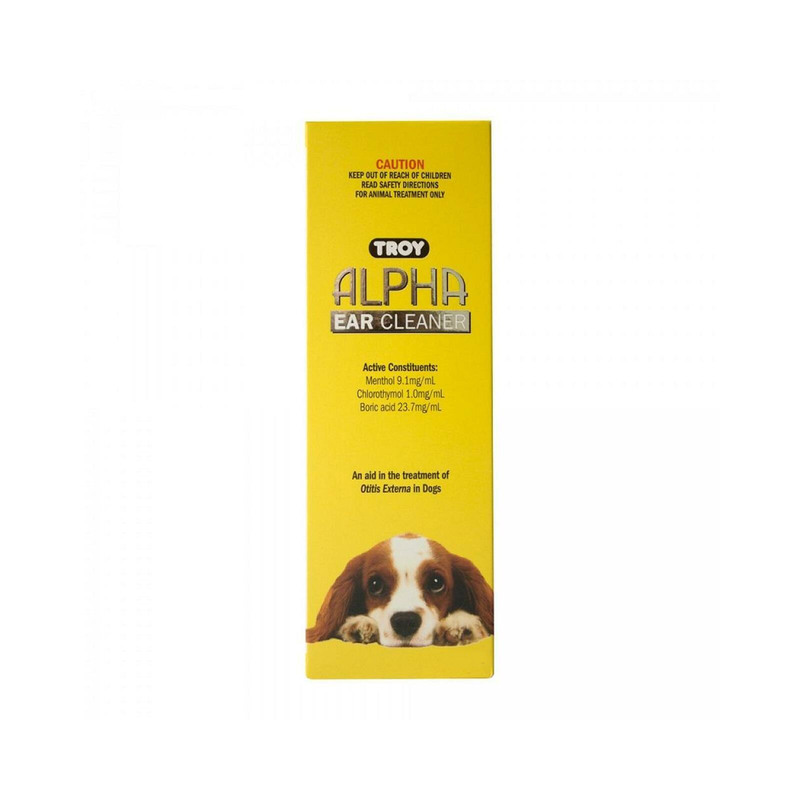 The major ingredients in Troy Alpha ear cleaner work as antiseptic, antibacterial, antifungal and antipruritic. It helps in removing excess wax and cure inflamed ears. This low dose formula treats ear diseases and prevents ear problems. Put 5 to 10 drops in each ear twice daily as an adjunct to therapy. For prophylaxis put 5 to 10 drops in each ear once or twice weekly. An effective treatment for otitis externa in dogs and cats. It treats and prevents ear infections and protects pet ears from damage. Pet ear drops loosen hard wax and helps in removing to keep ears clean. The gentle formula is safe on pet ears. Apart from cleaning, it keeps ears odour free. It is suitable to use in conjunction with topical medications. Tightly close the container after use. Do not use in ruptured or perforated eardrum. Key Ingredients menthol, chlorothymol, and boric acid. I love this product. It cleans so thoroughly and removes even the hardest wax in my pet's ears. I regularly groom my dog and make sure his ear is clear of any wax. Alpha Ear cleanser is the product I have been using for this purpose and must say my dog has never faced any bacterial or fungal ear infections which other dogs usually go through. My dog was severely inflamed by ear infection after I returned from my vacation. Was surprised to inspect his ear and had to treat him immediately. Then my vet suggested cleaning his ear of Alpha Ear cleaner. He is fine now. Alpha is a good product and must be used by pet owners for any ear related issues in dogs. My dog's ears were smelly and covered with sores. He was continuously scratching them. I used these drops and within a week's time the infection cleared up from the day of administration. Highly effective product!!! My Labrador always had an ear infection, which made him suffer. But since I have started using this product the results have been marvellous. Now I do not have to visit the vet for ear infections. It is very effective and swift. Thank you!! !